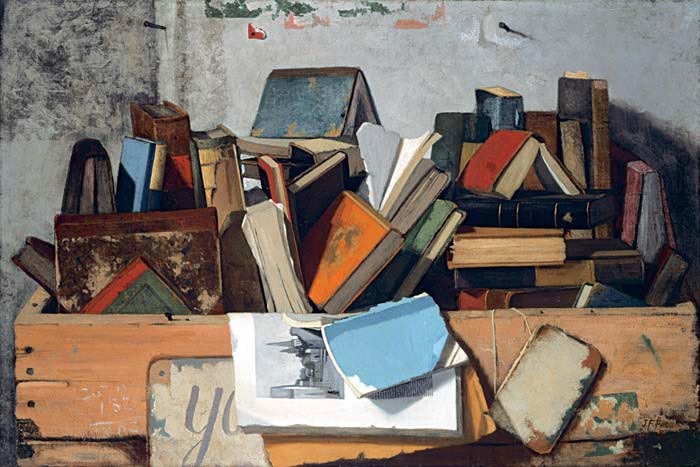 Take Your Choice, 1885, oil on canvas by American artist John Frederick Peto (1854–1907). Image courtesy of the National Gallery of Art website. Illinois native William Maxwell first arrived in New York City in 1933, hoping to find employment and having just received a Master’s degree from Harvard. During the next two years he published his first novel, Bright Center of Heaven, and placed stories in various magazines—but the lack of jobs during the Depression forced him to leave the city several times, either to Wisconsin, where he performed odd tasks at an artist’s colony, or back to Illinois, where he graded papers for room, board, and $4 a month. In February 1936 Maxwell completed his second novel, They Came Like Swallows, told from the point of view of an eight-year-old child living through the devastating 1918 influenza outbreak, and it was acquired by Eugene F. Saxton, the editor-in-chief for Harper & Bros. Through Saxton’s influence, New Yorker fiction editor Katharine S. White purchased two of Maxwell’s short stories. Maxwell’s early duties included informing cartoonists of acceptances and rejections, but by the end of December (when the two stories purchased earlier appeared in the magazine), White and senior editor Wolcott Gibbs began training Maxwell to edit fiction, memoir, and humor. In March 1937 They Came Like Swallows appeared and was chosen by the Book-of-the-Month Club for its April dual main selection. When Maxwell received his first check for $8,000 from the book club, he “went into Wolcott Gibbs’s office to tell him and could hardly walk, stunned by the overwhelming sum.” During the following year The New Yorker accepted five more of his stories, including “The Actual Thing,” in which the thirty-year-old Maxwell depicts a fifty-seven-year-old bachelor obsessing over the inevitability of death. By the mid-1940s Maxwell had increasingly and comfortably grown into the role of shepherding and editing authors for the magazine—often to the neglect of his own writing. One author in particular had been sending stories to Maxwell for nearly five years, hoping New Yorker staff members would overcome their reluctance during wartime to publish fiction featuring disaffected youth. Finally, Maxwell moved ahead and scheduled for the December 1946 issue J. D. Salinger’s story “Slight Rebellion off Madison,” featuring the character Holden Caulfield. Note: Among the books squirreled away in the attic are a volume of works by Robert Green Ingersoll (1833–1899), an American lawyer and orator known for forceful speeches supporting agnosticism; The Clansman, a 1905 historical novel by Thomas Dixon Jr. that romanticized the Old South’s resistance to Reconstruction and the rise of the Ku Klux Klan and that served as the basis of D. W. Griffith’s 1915 film The Birth of a Nation; and Truxton King (1909), the third of six best-selling novels by George Barr McCutcheon about love and intrigue in the royal court of the fictional Central European country of Graustark. The odor, if it was an odor, came from the other end of the attic, Mr. Tupper decided. He was looking about for a long wooden croquet box which had certain of his possessions in it—his Knights Templar sword, the works of Ingersoll, and an album of pressed flowers from the Holy Land. . . . If you don't see the full selection below, click here (PDF) or click here (Google Docs) to read it—free!